It's hard to believe but I've actually spent the majority of my Interior Design career as a self-employed creative entrepreneur. Not only have I learned a lot about business over the years, I have learned a lot about what it takes to efficiently and productively work from a home office. Working from home and still getting the work done is a struggle for many entrepreneurs which is why I'm so excited to share the guest blog post I wrote for The Identité Collective, a full service creative studio serving boutique lifestyle brands. In this post I'll share my top five interior design tips for creating a productive and inspiring home office. 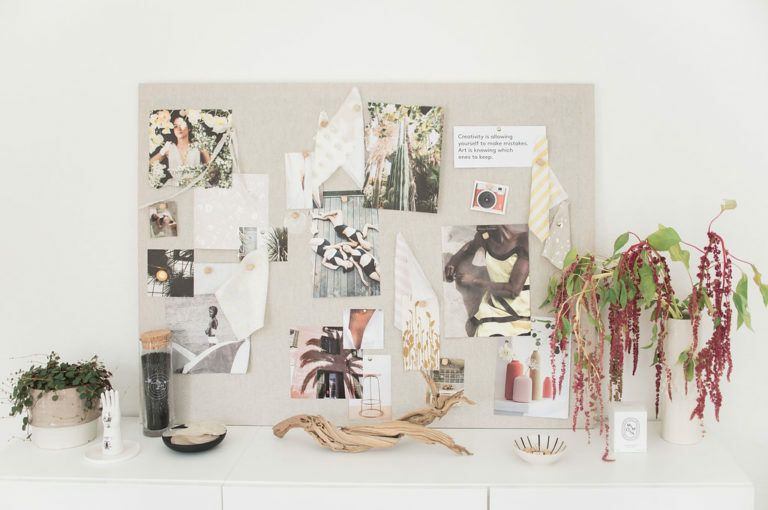 You'll also get a a never-before-seen peek into The Indentité Collective founder's new home studio, including links to her favorite office furniture, decor and gadgets. If you like bright, white spaces you want to see this home office! These tips work for everyone, no matter how much space you have in your home. Get my best home office design tips for entrepreneurs by clicking here. Subscribe and receive instant access to my DIY Guide to Jump Start Your Next Design Project! What comes to mind when you hear the word "minimalism"? A stark white interior? Only owning a prescribed number of items? To me, minimalism represents a pared down home and lifestyle. And at the same time, I own a few tchotchkes. Even thought these items are decorative and not functional, they are items brought into my home, and kept in my home with careful consideration. This little sheep sits on my desk simply because he makes me smile. Instead of looking at living a minimalist lifestyle as trying to avoid purchases or eliminate items in our life to the bare bones, I prefer to keep or acquire items based on the three simple questions below. If you're looking to live a minimalist lifestyle (and maybe own a few tchotchkes) you can use these questions too! 1. Is this item useful? If so, is it actually used or will I actually use it? 2. Why do I want to keep or purchase this item? Do I like my reason? You get to decide. What do I mean by "Do I like my reason?" Here is an example: I may simply find something beautiful and want to purchase it. There is a special spot in my office where I know it will fit perfectly. I like this reason - it feels fun to treat myself. Alternately, I may receive a gift that doesn't fit into my lifestyle. I feel guilt around giving it away so it sits in the closet. I don't like this reason - it feels heavy and burdensome. 3. Would I invite this item into my life or buy it if I was purchasing it today? Asking these questions allows you to move away from an external vision of minimalism towards a minimalist lifestyle that rings true for you. Your answers provides a framework within which you can eliminate the distractions and clutter that build over time. They also allow you to focus on the items you feel are most important and hold the greatest value for you and your family. Every minimalist lifestyle and home will look different, and that's ok. The key is that we ask ourselves, on on regular basis, what objects add or subtract value from our lives. We answer honestly, act accordingly, and give ourselves the freedom to live with possessions that are meaningful to us in the present moment. Have you tried applying these questions to your belongings? Let me know how it goes? We all have excess items in our lives which is why I began to discuss why we hold on to these objects. I've concluded that most excess items in our lives fall into three categories. In part one of this post I discussed aspirational items, or objects that represent the person we want to be. In part two, I discussed the objects in our lives that represent the person you used to be. Today, in the third and final part of this post I will discuss the most complicated of excess items - sentimental objects, or objects that evoke strong memories. Sometimes sentimental objects are items that bring you pleasure, such as a platter passed down from generations that is always brought out for special occasions, but sometimes sentimental items can feel weighty. Perhaps an item was a gift from a close family member or friend. The gesture was appreciated but the item does not suit your lifestyle or aesthetic. Or perhaps it was a favorite reading chair passed down from your father. You can picture him sitting in it reading the paper every night. But you haven't looked at it or used it in a long time because it's in a storage unit or it's not practical in your home. Emotions tied to our belongings are complicated so it's often easier to simply hold tight to these items. Today I challenge you to consider the possibility that the emotional ties and corresponding memories can live on without physical possession of the item. Below are ways to cherish and honor sentimental objects in your life when you are ready to move on from their physical presence. This can be especially helpful if you have a lot of large items taking up space. Photos can be placed in an album for future viewing and sharing. If it's a unique collection you might consider having select favorites professionally photographed. Create a gallery of these images on the wall as a way to experience the objects as art. My grandma had an extensive collection of Hummel figurines. As a little girl I loved to look at each one as she carefully brought them down from her display. When she passed I knew I did not have the space (or the desire) to keep the entire collection. However, I did decide to hold onto one figurine in particular, the "Little Pharmacist." Of all of the figurines I remember delighting in his dripping medicine bottle. One piece of her collection is able to revive those memories while not requiring me to keep the entire collection. This item may not suit you, but it could be the perfect addition to someone else's life. When you pass on an item think of how someone else will incorporate the object into their own life. It could become a cherished piece of someone else's family. If you didn't have this item taking up space, how would you feel? Would you feel relief at having the extra space or maybe there is another item you actually would use that could take its physical space? If you are selling the item for cash or using it as a trade you can think of the gifted as having helped you bring this new item into your life. Does your grandmother's buffet not fit in with your décor? Consider painting it or changing out the hardware. Or maybe you don't have a formal dining room where you feel it ought to be place. What if you reimagined the purpose of the buffet? Could it become a TV console or dresser that you would be able to use? If looking at or touching the item brings a rush of memories take some time to sit with those emotions. Pull out your favorite writing tools or create a voice recording to capture the place this item once held in your life. Attach a snapshot so when you share your story with others they have a visual. This is not to say you need to get rid of everything, but it does mean that you should be selective. If you decide to keep something for sentimental reasons, how can you incorporate the object into your everyday life or at the very least, find a way to incorporate the item(s) on a regular basis? What is the biggest challenge you face when deciding what items to part with? What are the items that are so special they remain in your life? Do you own or purchase items that represent the person you want to be rather than honoring your current position? Lately the idea of excess belongings has been on my mind. What's the how and why behind the objects we tend to accumulate? As I have thought about this topic I've come to the conclusion that excess items in our lives most often fall into three categories - (1) objects that represent the person you want to be, (2) the person you used to be, or (3) objects that have a strong emotional pull. In part one of this post I'm sharing my thoughts on aspirational belongings - objects that represent the person you want to be. Do you aspire to be a person that entertains, one that makes exercise a consistent routine, or one that cooks dinner every night? New habits are hard to implement so we find ourselves looking for a quick fix to fulfill these lifestyle aspirations. We might purchase a set of fancy barware or the latest kitchen gadget. These items provide an instant ping of excitement that you are headed in the right direction. And for some, they are a good sign. The desire to use these items may actually spur you to invite friends over or work on your culinary genius, but if you don't have the solid intention of performing this activity, and most importantly, a plan as to how you are going to implement, these items often sit gathering dust in the home. If you find yourself acquiring aspirational objects, here are some tips to consider before the purchase to ensure that they are actually used. 1. Consider how you currently live and get super specific on what you want and why. For example, if you want to cook dinner every night - what are you after? A healthy meal, a chance to slow down at the end of a hectic day, time to reconnect with your spouse or family? What are some behaviors you could work toward? You could aim to prep one or two healthy meals on Sunday so prep is minimal during the week or you could agree that all family members are home one night a week to do an activity together, even if it is quick. Do you really need to purchase something? Or is there a behavioral shift you could make to achieve the same feeling or outcome through different routes? 2. If you do decide to purchase something new, get specific on how you are going to use the item. For example, once you purchase new tableware for entertaining, set a date with friends for a gathering. Make it a goal to invite friends or family over once a month. Do whatever works best for you, but make a plan. 3. Set the routine to achieve the desired results and then treat yourself once you get in the flow. This is the dangling carrot theory. You don't need the latest gear to get going on an exercise plan. Allow yourself a treat such as a stylish workout ensemble after making it to the gym for a certain number of days. You'll find yourself buying less and using more of what you have. So what do you do if you find yourself with a pile of aspiration purchases? I always like to remind myself that awareness is the first step in making a change. If you don't acknowledge that you are either buying or holding on to items that don't actually serve your lifestyle you won't be able to start to make the changes necessary to discontinue the cycle. Stay tuned for part two where I will discuss items that represent the person you used to be, another source of excess "stuff" in our lives. In the meantime, I'd love to know, are you an aspirational purchaser? What have you've purchased? Do you use these items? If not, how does that make you feel to have them sitting around the house? If you don't fall into this category what keeps you from accumulating aspirational items? Is your lack of kitchen organization slowing you down in the morning? I used to think it was tough to get myself out the door on time in the morning, but now that I have a toddler to get to preschool, mornings are even more chaotic. I've always been an organized person but more and more I am finding that calming the chaos in the physical space will calm the chaos in your daily routines. These kitchen organization tips are about using the space you have in the most efficient way possible - no kitchen remodeling required! In this first step, consider how you move throughout the kitchen as you prep for the day. What is the sequence of items accessed? Utilize this information to inform where things are placed within the kitchen. For example, I keep all of our zip lock bags and lunch containers in a drawer directly adjacent to the refrigerator. As I'm pulling together food for the day I have everything I need on hand. There is no walking this way and that. Our kitchen is not large but the back and forth (especially when navigating around a toddler that wants to be picked up and a dog looking for crumbs) can really slow you down! I can't stress this enough. Select a spot for every item in your kitchen and always put it back in the exact same spot. You'll be able to function on autopilot as you grab for ingredients, utensils, etc. It might sound extreme but I even have a spot for where the honey goes - bottom shelf of the pantry, next to the vanilla extract. This also makes prepping for grocery shopping so easy. With a quick scan of the shelves and the refrigerator I can immediately pick out if there are staples missing that need to be replenished. If something only works half of the time you're going to spend a lot of wasted energy, and become frustrated, when said item is out of service. And as you know, things tend to not work when you are the most pressed for time. Make a list of what needs to be replaced and head to Target or Amazon. The second part of this is to toss, donate, or recycle the old items. I often find that after a replacement is purchased, the damaged version is kept as a back up. If it's broken or not in service it's not really a back up. Clutter is only going to slow you down. Take stock of what you use infrequently, especially if you are short on space, and find these items a home in an alternate area such as the basement, under the stairs, etc. Even if you have enough space in the main kitchen area, I still recommend separating the infrequently used items from the frequently used items in the pursuit of efficiency. These could be items such as a bread maker or holiday-themed servingware, but I also encourage you to look for other items that might be getting in your way. For example, my spice drawer only contains my favorite staples. Spices that I use infrequently I keep in the pantry. That way, when I'm cooking I don't have to sort through extras. Re-evaluate periodically if you do store the items out of sight. If you haven't used an item in a year it's time to donate. What are your biggest challenges when it comes to efficient kitchen organization? Do you have any tips that help you move through the kitchen with ease? Sign up with your email address to receive news, blog updates, and exclusive content for subscribers.